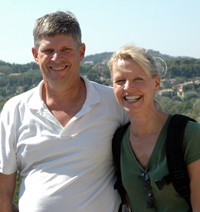 Castellina in Chianti, Italy – It’s been great for Dan and me to have so much time together during this sabbatical. Our jobs and lives at home keep us very separate. Like many couples our age, we often share the same space and time but not the same experiences. During four weeks of absolute togetherness, we’ve had a few moments of fatigue-induced crabbiness (mostly mine). But for the most part our time together has been cozy, collaborative and comfortable. We’ve rediscovered what good friends and easy travel companions we are. I’ve come to rely on our shared troubleshooting of common inconveniences and errors. On Monday, I decided to reassert my independence. We needed groceries. Dan was happily settled on the couch with a book. I was restless and eager to fly solo for awhile. Going for groceries may not seem like a big deal, but it is when you’ve never driven an Italian car in Italy. Our Fiat rental car (or van, really—it seats seven so we can accommodate shifts of guests we are expecting soon) is a lot bigger and boxier than most of the cars we see on local roads. And the roads are much narrower than what we’re used to in the greater-Phoenix area. Ancient stone walls on both sides of many city center roads feel like they’re closing in on you. Then a delivery truck or (even scarier) an enormous tourist bus starts charging your way from the other direction. Don’t even get me started on the challenges of parking an oversize vehicle in spaces better suited to Smart cars. And then there are the hazards of distracted pedestrian tourists, local residents darting in and out on bicycles and motorcycles/scooters following no apparent rules of engagement. I’ve read a lot of stereotyped descriptions of Italian drivers (who are often accused of hyper-aggressive driving and chronic tailgating) but I prefer to look through the same lens as Joseph F. Lomax: “People who say Italians do not know how to drive are measuring them by the wrong yardstick.” Italians are skilled, attentive drivers. It’s their very confidence that makes you realize how scared and uncertain you are. And there’s one more thing: The Fiat has manual transmission, which neither of us has driven in, well, close to 30 years. And it has an unbelievably finicky clutch. This was confirmed by John Genzale, a writer and friend who lives in Como. John graciously agreed to do the driving when we visited so we could enjoy the views–and probably because he saw how freaked out we were. When I decided to take the car out for the first time I wanted to do it alone. I didn’t want anyone watching me or telling me what to do or try (like I’d been doing to Dan). And I certainly didn’t want anyone I knew within earshot if I got myself in trouble. I learned to drive a stick shift at age 22, when I bought my very first car as a newly employed reporter for The Pacific Daily New on Guam. I paid my deposit, got the keys for my brand new white Honda Civic and sat down in the driver’s seat. I panicked when I saw the four-on-the-floor gear shift. I looked at the salesman sheepishly. He gave me a very quick description of what to do and I was on my own. The dealership was at sea level; my apartment was at the top of a very high hill in Agana. Motivated by a strong desire to keep my life, my job and my new car, I very quickly figured out the “feel” of the clutch and the gear shift. I was no less motivated to reach an understanding with this Fiat. I went outside, started the car and…couldn’t remember how to put it in reverse. I struggled for several minutes before swallowing my pride and heading back to the house to ask Dan to explain it. Back in the driver’s seat, I backed up and pulled forward to ease down the rutted gravel road leading from our villa to the road below. I crept slowly and carefully into town, allowing everyone behind me to pass. I made it to the store, managed to park, bought groceries and headed home. The road leading to our villa pops out of nowhere after a hairpin turn. I made a sharp right turn, crossed a narrow bridge that doesn’t look anywhere near wide enough to accommodate a mini-van and experienced an elated sense of accomplishment I haven’t felt in a very long time. “That was fun!” I declared, a bit over-confidently, as I walked into the kitchen with our groceries. He didn’t even flinch. That’s the amazing thing. When I came home that day, I told my husband what had transpired during what should have been an absolutely routine photo shoot. I told him about meeting Keri deGuzman, her husband Brian and their two adorable children, Jesmina and Musse. I told him how Keri and Brian had traveled to Ethiopia to adopt their children, and how they were planning to return to adopt two more. And then I told him they’d invited me to go with them. I first met Dan when I was 25 — a year older than our son Andrew is now. I had just moved back to Arizona after a four-year stint on the island of Guam, where I had finished my senior year of college and worked as a journalist for the Pacific Daily News. I had just broken up with a Guamanian man who had once asked me to marry him. So when I started my new job at The Arizona Republic, I wasn’t particularly interested in starting a new relationship. I was still living with my parents after returning from Guam, so I was eager to get my own place. A friend at work was living in an apartment complex near Seventh Street and Bethany Home Road. She liked her apartment well enough, so I decided to move into that same building. Little did I know how momentous that simple decision would prove to be. The day I moved in, my friend introduced me to Dan Barr, who also worked at the Republic and lived in the same complex. I was happy to make a new friend — especially one who was willing to help me move my boxes up the stairs to my second-floor apartment. We had the same odd days off (Sunday and Monday) so we’d often run into each other at the pool or in the laundry room. Eventually we started going on bike rides, hikes or walks around the neighborhood. Then movies. Then dinner and movies. A year later we were married. 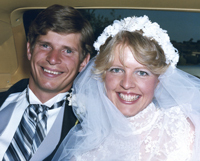 On our way to the wedding reception: April 17, 1982. How do you recognize the “right” one? I find myself pondering that question as our sons rapidly approach the time in life when they will choose life partners. My marriage did not get off to a particularly dramatic or romantic start. It started quietly, with friendship and shared interests and long conversations. It was comfortable, reassuring, reliable. From the moment we first started “hanging out” together, I knew Dan was a good man — a solid, grounded man who’d grown up in privilege but emerged with humility and great depth of perspective. A man secure enough in himself to allow me to be whatever I wanted to be. I’m not sure how I knew all of that when I decided to marry Dan; I just did. And though we’ve experienced the ups and downs any honest couple married for almost 28 years would admit to, I have never wavered in my certainty that he was the right choice. Twenty years ago this month, I was preparing to send my first issue of Raising Arizona Kids magazine to the printer. Though our young family had to absorb the cost of that first printing bill (and many others to follow), my husband never flinched. He believed in me, so he believed in my reasons for starting a magazine. Since that time, he has been a source of steadfast support, my biggest fan in any undertaking — no matter how great the cost to our family finances or my emotional reserves. During a family trip: July 2009. On Jan. 2, I launched a project called “1,000 People to Thank Before I Die.” It is my version of a “bucket list” — an attempt to acknowledge the people who have guided and influenced my life before I lose the opportunity to do so — and was inspired by the book 1,000 Places to See Before I Die.